Axillary abscess in a septic shock patient. 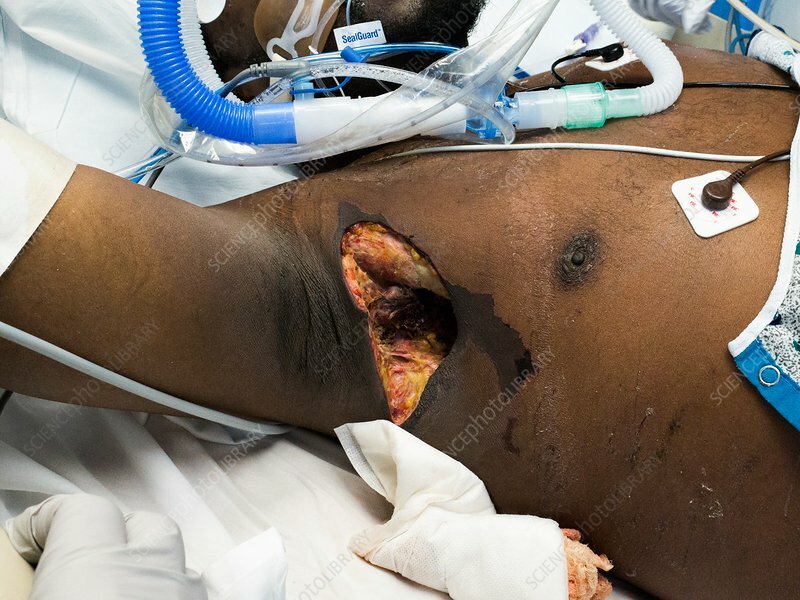 Close-up of the armpit of a ventilated patient in an intensive care unit (ICU), who has a large axillary abscess which has been drained and debrided. There is skin necrosis (dead tissue) in the axilla (armpit). The abscess caused the patient's septic shock. An abscess is a local collection of pus, usually due to infection. In severe cases, an abscess may need to be surgically drained and cleaned. Septic shock is a physiological condition that occurs due to an overwhelming infection, especially septicaemia (blood poisoning). Septic shock can be fatal.